So I decided to end 2011 with a bit of the plague. Ok, I can't be sure that's what it is exactly, but it sure felt like it. It might have been the worst I have ever felt. The thought of even sitting down at a computer made me sick. It takes quite a bit to keep me from my electronic addiction. Today I am feeling better, maybe around 60%. Thankfully, this week is pretty useless in most industries so it wasn't a huge deal. Hopefully by the time the 1st rolls around I'll be fully recovered and start out the new year right. As for New Years Eve, we have young kids, which means I doubt we'll even see 12am. I hope those of you that have something to do and can actually stay awake, have a great time. See you next year! 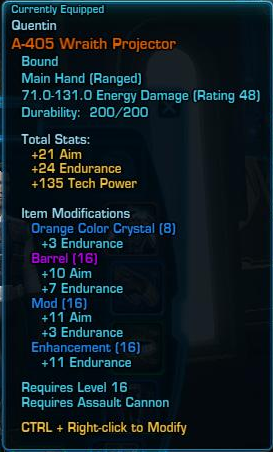 As I have mentioned before, Custom items are one of my favorite aspects of SWTOR. Like an appearance tab, they allow you to control the look of your character. What they do better than an appearance tab is keep the items a part of your gameplay instead of setting and forgetting. Since Custom items are all about looks, it's important to know what look like before you buy them. To do this, just CTRL Left Click on an item and viola, a dressing room window. This can be done on vendors, your inventory and the Auction House. Also, you can check out companion appearances this way too. Here I am trying on a new helmet, Commando's Helmet, which is cratfable by an Armortech. You can also see what it looks like on your companion. There are no class restrictions in the dressing room either. So try on those Consular Robes if you want. You can rotate the model in this view as well. Sadly, you cannot seem to see what a weapon looks like in this view. I hope they add that feature soon, as choosing the right looking gun is very important for a fledgling Trooper. Sadly, we found out yesterday that the upcoming 1.4.5 patch will not be on the PTS in time for the impeding holidays. It seems they had some technical issues on their internal servers which forced them to hold off for now. That doesn't mean there is nothing happening to tide us over for the break. Be sure to read the rest of James' update. Bonus RP. For as long as Keg's End runs run there will be a holiday bonus to RP and XP. Dev Discussion. They will post some of the details involving relics and forts later this week. Scenario Update. The new scenario lineup will be pushed out prior to the holiday break. This includes two 6 vs 6 scenarios: Gates of Ekrund and Caledor Woods. One thing that would be very WELCOMED would be unlocking Eternal Citadel during IC siege and unlocking College of Corruption (6v6) during Altdorf siege. Sounds good to me, and James also said: "I can look at that for the future as something to do, sure." While it is disappointing that 1.4.5 did not make it to the PTS, these things happen. Luckily there is plenty to keep me busy ( Holidays, SWTOR, Skyrim ) in the mean time. This feels appropriate, and will pass a small part of the queue time away. 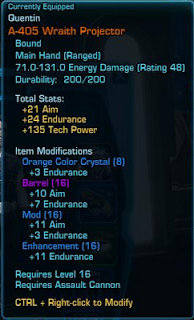 One of the small frustrations I have with Star Wars: The Old Republic is the amount of XP you gain, at least early in the game. By doing all of the quests given to me, I have started to really outpace the content. On Coruscant it was especially bad. By the time I was dealing with the Justicar's, I was already 2+ levels ahead of the content. At that point I started to skip quests which didn't seem important, same goes for Heroic's and Bonus Missions. By skipping content, I managed to arrive at Taris only 1.5 levels ahead of the content (17.5). The next planet, Nar Shadaa, starts at level 20, so I am going to have to skip missions on Taris too. The fact I am being flooded by XP also makes me reluctant to do Warzones and Space Missions, since they also reward XP. I could really go for an XP off switch at this point. I've heard the XP situation improves in the later levels, so we'll see what happens. I really dislike skipping content. One reason is I might miss out on Custom item rewards. The SWTOR item databases available have not tied item rewards to missions yet, and TOR missions do not tell you the rewards ahead of time. I could always go back and do them later, but that just doesn't feel right. Another reason is that some of the quests are fun and interesting. I'd really hate to miss the start of a quest chain just because I need to limit my XP intake. I've also been avoiding Cantina's so I don't build up any bonus XP. In the near term, there really isn't much that can be done. I doubt I'll see an XP off option, or a change to the XP rewards in time to be useful to this character. Beta 4 of Wrath of Heroes will include two brand new heroes. One you might expect, the other is not really a traditional player class in Warhammer Online. When Mythic mentioned Tobias, I guessed a Witch Hunter. I was wrong. Tobias is a Knight of the Blazing Sun. He prefers a large 2-handed sword to a shield. And much like his WAR Live counterpart, he enhances his allies. No word on what the Blessing of Myrmidia does, but we'll find out soon. Rockgut is the second hero, a Troll! Not of the Internet forum variety, but pretty nasty none the less. This guy is a melee healer with some regeneration. He also likes to burp and throw up. A classy kind of guy. It's nice to see a hero from outside the career lineup of Warhammer Online. There is so much potential in the Warhammer lore, we are barely scratching the surface. The next Beta session starts this week! Beta 4 comes with a new version of WoH and will start Friday, December 16 at 11am EST (4pm GMT). The servers will be online non-stop until Tuesday, December 20 at 11am EST (4pm GMT). Well, it's been quite a week for Star Wars: The Old Republic. We found out that Early Access (for those that pre-ordered) will begin on the 13th instead of the 15th. How often do MMO's start ahead of schedule? Then we found out there is no grace period to account for shipping delays. That's a bit odd, as I remember most MMO's having one. Factions. Darth Hater had an interesting lore post about different factional conflicts going on in the TOR universe. These are areas ripe for new content. I'd love to be able to pick sides and experience a story in the Czerka vs Wookie conflict. Healers. Laura from the Force Junkies gives us a breakdown of the different healers in SWTOR. Since a number of classes can spec healing, it's good to know what each brings to the table. Early Access. Syp discusses the whole Early Access situation. I am pretty happy about getting in potentially two days early. As for the grace period, not sure it'll affect me. I'd certainly like a day or two to be sure though. Tanking 101. 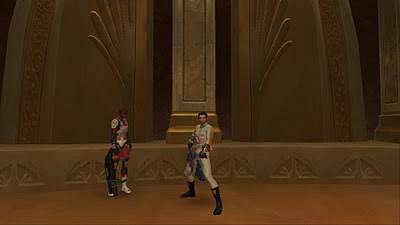 Elicas, also from Force Junkies, put up a guide discussing the basics of tanking in SWTOR. It's a good place to start if you are planning on taking that role. I will be going DPS or Healer on my main. Preferences. 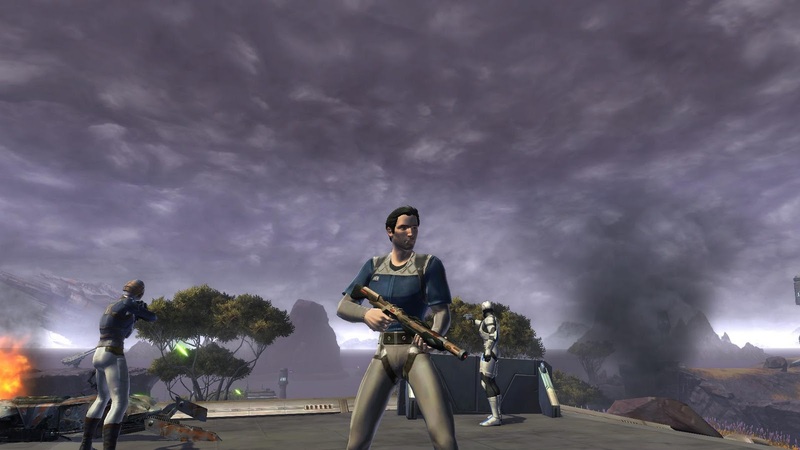 Swtor Life has a comprehensive guide to the preferences in SWTOR. It goes over, in detail, what every option does, pretty helpful if you are not sure. You can find Part 2 here. Million Credit Mount. Well, 1.5 million to be exact. This is a video of a mount which you can purchase from a vendor in the VIP lounge. It is pretty sweet, if not a little big. Outlaw's Den. Check out this video of TOR's Free for All area, the Outlaw's Den. There are no other players around, so it is more of a tour. Ilum. A video of Ilum, TOR's objective based PvP area. How awesome is that Troopers robot companion? Subject Alpha. The Guardians of Peace took a video of their battle with Subject Alpha, a world boss on the planet Taris. TOR Datacron links and video gathered from the TOR Nexus. What's this, a post not about SWTOR? I figured I'd switch things up a bit today and check in with Wrath of Heroes. WoH is currently in between beta sessions, but seems to be progressing very nicely. Let's take a look at what's been happening. New Web Page. The team over at BioWare Mythic improved the Wrath of Heroes web page, now it has content! Be sure to stop by and read the latest news. I'm very glad to see them not just using Facebook. Progression. During the last beta, the patch notes mentioned the addition of Mastery levels once you reach 40. Sadly, that's all we really know about them. In this news article, they also mention a new progression system. I can't wait to see what it is all about. WoH felt like it lacked depth, and this might help. Black Fire Pass. 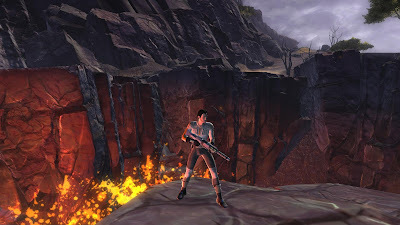 A new map was introduced called Black Fire Pass. You can watch a video of it here. New Hero. A new Hero is on his way, his name is Tobias. Gold. There is now an in-game currency! This opens up a lot of possibilities and means we will likely be able to buy some things without using real money. 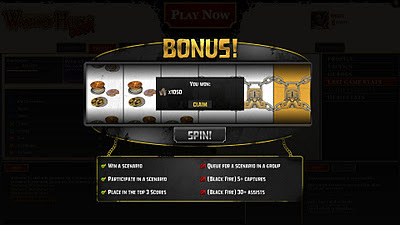 Reward Spinner. 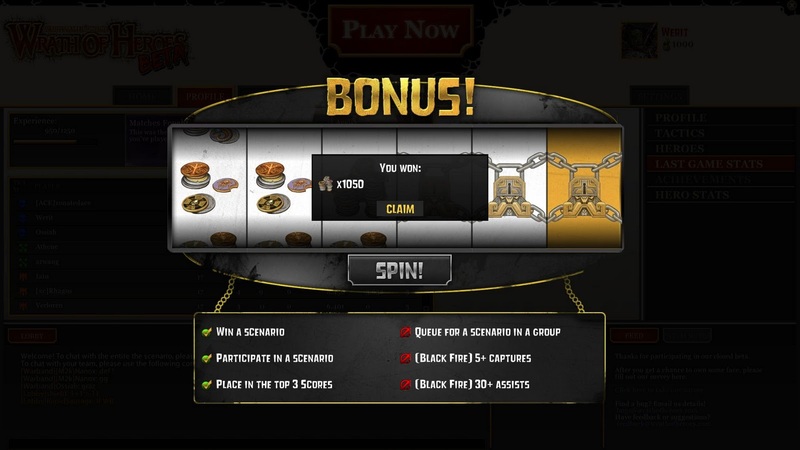 Another new feature is the Reward Spinner. When a match is over, you play a slot machine to determine your reward. How many spinners you unlock depends on your performance. No news on when the next beta is, but I am looking forward to checking it out. Each session makes large strides from the one before it. The crafting (or crew skills) system in Star Wars: The Old Republic is pretty interesting. While it is based off of the run of mill MMO crafting system, it's more broad. What I like best about it is that you can send your companions out on missions to retrieve crafting materials. So while I am fighting in a Warzone, I can still be making crafting progress! As you probably know, my first character will be a Trooper/Commando. He wears heavy armor and carries a very big gun. It's time to decide which crew skills I will take. I like to start with the actual crafting skill, which I've narrowed down to two choices. Armortech. This crew skill focuses on making armor (surprise! ), which includes heavy. I've used this in beta with my Bounty Hunter and it produced some nice pieces. Unlike the next crew skill, I make use of a number of armor items. Another positive of Armortech is that it makes use of Underworld Trading as a mission skill. According to this dev post, UT will be able to get Custom schematics. These are basically shell items you can mod all the way to the end game if you like the look. Arsmtech. 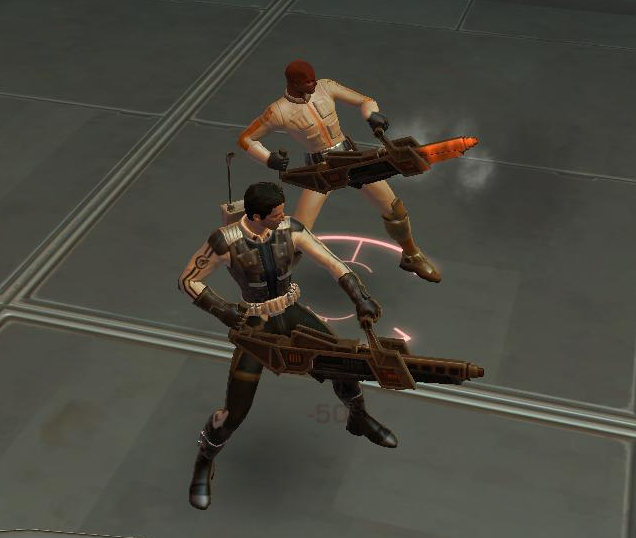 This crew skill makes weapons, including heavy blaster rifles. The Commando is all about his gun, so being able to craft the best would be beneficial. On the downside, my companions and I can only use a limited amount compared to armor. Despite no need for Underworld Trading, I am still leaning toward Armstech. The allure of crafting weapons for my Commando is just too much. Hopefully, BioWare either spreads about the Custom schematics around the rest of the crafting skills, or they are rather common on the GTN (auction house). For more info on SWTOR crafting, try the TOR Nexus PvE page. Sadly, the SWTOR beta has come to an end. I was in it for a couple of months and had a great time. Luckily, the launch of the game is only 10 days away! A week or so ago I made a video of my level 15 Bounty Hunter Mercenary in the Alderaan warzone. PvP is better than I thought it would be in The Old Republic, not perfect, but pretty fun. As you can see from the video, I am doing some healing. That is one nice thing about the classes in this game, they are all hybrids. While all Mercenaries can heal, I've been concentrating on the Bodyguard tree which enhances healing. Once of the interesting abilities Mercenaries get is Combat Support Cylinder. When active, it changes your spammable attack (pistol shots in my case). When targeted at an enemy it does damage as you would expect. When an ally is targeted, it will heal them. It's a small heal, but does not build up an Heat so you can always be using it. The Bounty Hunter is a fun class and very versatile. So it comes as no surprise that warzones were crawling with them (and Sorcerers). Can't go wrong with fun combat and a good story. Want more SWTOR PvP? Stop by the TOR Nexus PvP page. In the fine tradition of the News from the Front posts comes the Nexus Datacron. These posts will basically showcase some of the interesting community content for Star Wars: The Old Republic. I will, of course, be counting on the TOR Nexus to help find these gems. That's enough intro, let's get to the good stuff. Bantha PooDoo. The latest issue of the Jedi Gambit is up! Rackham, who also made the awesome banner for this site, continues his excellent web comic series. Advanced Respecs. Torwars has a post discussing the latest news about respecs of your Advanced Class. Spoiler: no respecs at this time. I'm not surprised, Advanced Classes are really just classes. Accessories. Scary Worlds let us know that in order to get the 'full SWTOR experience' you may need to shell out around $1,000. This includes all those custom accessories that razor is putting out. What's my name? Syp has some concerns about the recently announced Legacy system. Specifically when it comes to choosing a surname or title. I'd have to agree with him, I really don't want to feel rushed to go claim my name. Patch Notes. Darth hater posted a copy of the latest beta Patch Notes. Nothing too major in there, just a lot of bug fixes and polishing. Data Mining. Darth hater also posted the results of their data mining the latest patch. Looks like a ton of items and recipes were added, but not really mentioned in the patch notes. Easter Egg. 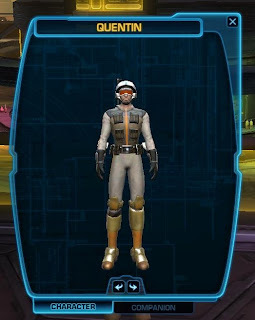 SWTOR does indeed have some Easter Eggs. This one is pretty awesome and has to do with Night at the Roxbury. Legacy. Speaking of the Legacy system, MattOwen07 posted a video showing how it works. Ilum. 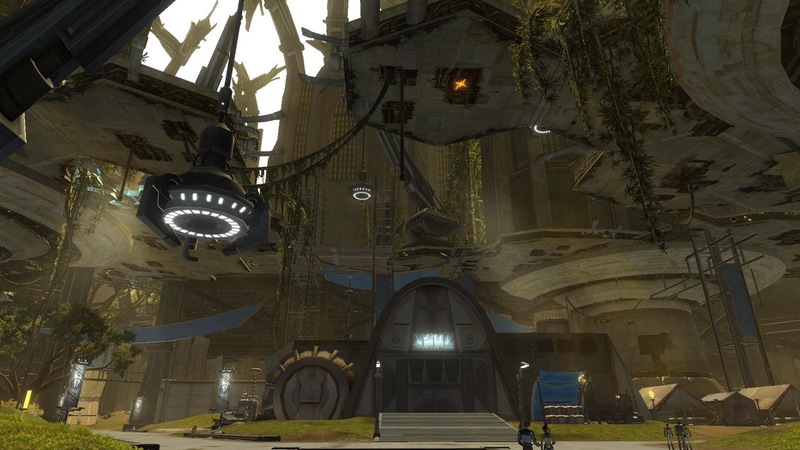 Wondering what SWTOR's PvP planet, Ilum, looks like? Here is a video tour of the battlefield. Space. A look at one of the space combat missions you'll be able to do. Sure, it's not X-Wing... but it does look cool.